Today I have a few "business items" to share! 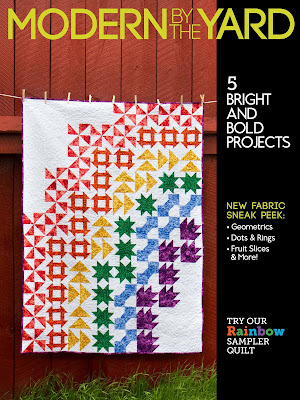 First, I am very excited to share that the FREE one page pattern for the Ombre Everest mini quilt is now available! If you make your own version of this quilt, make sure you share on social media with #OmbreEverest! The complete pattern of Christine's Kitchen is now also available! 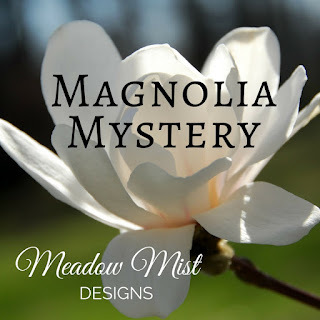 Finally, we are excited to share that we are a sponsor of the Magnolia Mystery QAL hosted by Cheryl of Meadow Mist Designs! At the end of the quilt along, one quilt finisher will be able to chose a pre-cut or bundle of their choice from our Etsy shop! 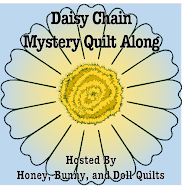 I am also excited to share that the Meadow Mystery QAL Kona specials are now live! Don't delay -- this special will only run until the end of July! If you're interested in a color that we don't currently have listed as part of the bundle special, send us a message on Etsy and we can see what we can do! Update: the giveaway is now closed, winner noted below! Happy Thursday! Today I am your host for the Folk Art Fantasy blog hop, showing off Amanda Murphy's latest fabric collection! I have long been a fan of Amanda Murphy's fabric, and this collection is no exception! The prints are fun and unique! This one might just be my favorite because it has bunnies in some of the prints! I decided to use this as my inspiration to make some reversible patchwork and applique bunny placemats! Before we start cutting, we need to sort our 10 inch squares. You will not need all of them! 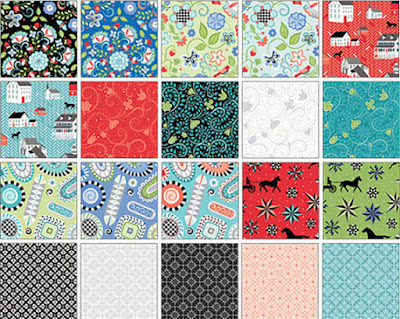 -- Choose twenty four (24) squares that will be your "featured" fabrics on the "front"
For clarity, I will call the side with our applique bunny the "front" and the scrappy patchwork side the "back". For each of your twenty four (24) featured fabrics, cut the following pieces in order: cut a 10 x 3.5 inch strip first, then cut the remaining piece into a 6.5 inch square and a 6.5 x 3.5 inch rectangle. By cutting precisely and in order, you will be able to cut these three pieces from a single 10 inch square. Set aside your 6.5 x 3.5 inch rectangles and your 10 x 3.5 inch rectangles. Using your twenty four (24) 6.5 inch squares, sew together in groups of six to create four "front" pieces for our placemats. Trace the applique motif of your choice onto fusible web four times. Iron these onto your four white or light colored squares and trim along the edge of the design. Remove the backing paper and iron onto the center of each placemat "front". Machine applique as desired. For each "backing", you will need six (6) 10 x 3.5 inch rectangles and three (3) 6.5 x 3.5 inch rectangles. (You will have twelve extra 6.5 x 3.5 inch rectangles.) First, sew your 10 x 3.5 inch rectangles in pairs of contrasting fabrics, and then sew a 6.5 x 3.5 inch rectangle to each pair, as shown in the first picture. Sew three of these units together for each backing, for a total of four backings. Layer together the backing, batting, and fronts and quilt as desired. I love to use batting scraps for projects like these! Note: your front pieces and your backing pieces will be the EXACT same width. Make sure to align them when you're pinning! The giveaway will be open until Monday morning! Update: our winner is Emily C! If you haven't already, check out the rest of the posts on this week's hop! 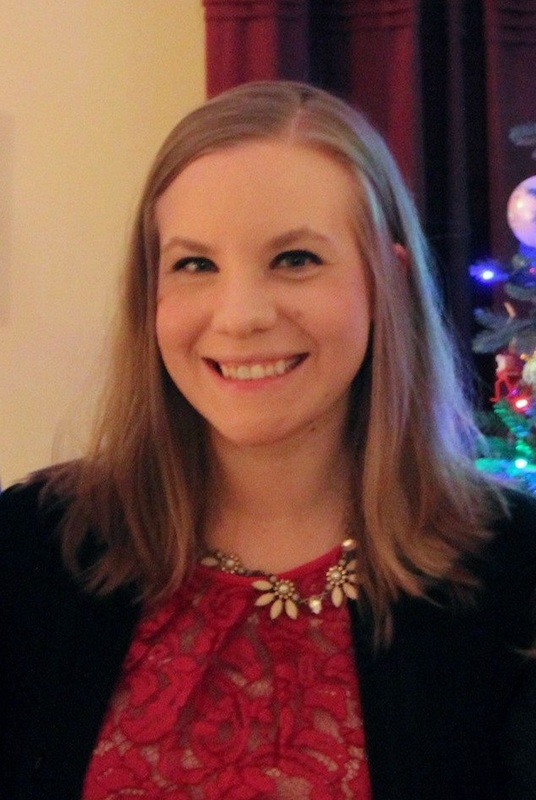 Thanks to Amanda Murphy and Benartex for inviting me to share Folk Art Fantasy with you! 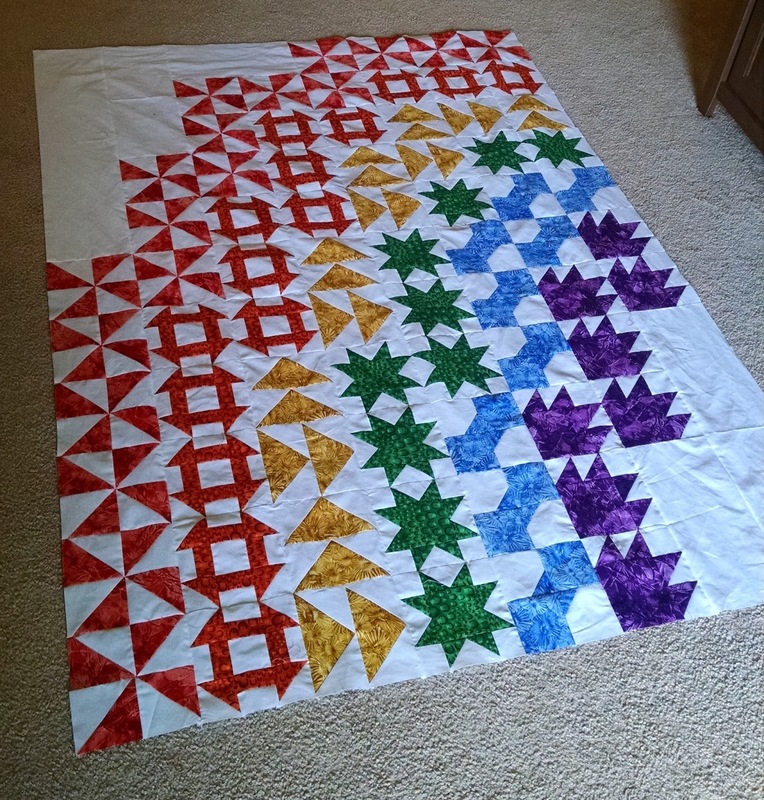 I'm not quite done putting together my Cora's Quilts Gathering Mystery QAL top, but I figured I should give a quick update! I finished putting all of my blocks together for Week 10, which required lots and lots of pins! I only had one that I partially took apart and fixed! I then quickly progressed into sewing the sashing pieces to my blocks, meaning even more pinning! Pinning made the matching nearly perfect and I think thus far I've only taken out part of one sashing + block combo. And then you pair your pairs and finish off the row! Now all four of my block rows are completed! I also completed my horizontal sashing rows. These were much quicker to put together since there wasn't any matching! Last night I was able to pin each block row to a sashing row. These are ready to be sewn (and look like almost no easing will be required!) as soon as I can sit down at my machine! Have a happy Monday! For once, it's not oppressively hot and humid in MD so I am wishing I could be outside! Sharing at Monday Making, Linky Tuesday, and Let's Bee Social! I have finally caught up for the Rainbow Scrap Challenge for May and June! May was our month for green and June is our month for yellow. One of the slightly difficult things with my green May blocks is that I had to make sure that the grass green in each block had enough contrast from the green of the house. I think I accomplished that well and only had to switch out the grass on one block. As of right now, I have 30 blocks (hidden somewhere in my stash!) I might need to locate some additional brown for the roof fabric. I should have enough sky blue fabrics for at least two to three months' worth of blocks. My goal is to have 42 blocks for a 6x7 block arrangement, so I only have 12 more blocks to make over the next 5 months! My June IBA project is now complete -- and ready to hang up! As I planned, I quilted with peach thread in the flowers, green thread in the leaves, and off-white thread in the background. I quilted feathers in the leaves, meanders in the flowers, and loops in the background. The backing is also from the new Bonsai collection from Island Batik. I used two of the "rainbow" floral prints and since I had two half yard cuts, I had to piece the back. The binding is the lighter green fabric that I used in the leaves. Now to hang this on my wall! Sharing at Let's Bee Social, Free Motion Mavericks, and Finish It Up Friday! The background is Kona Champagne and the fabrics originally came from a fat quarter of Clover Sunshine that I won from a now-defunct blog. Instead of pinning the whole quilt, I started off only quilting the center block and one block on either side. I always run into issues when FMQ-ing with my backing shifting, so I decided to not even fight it this time around, and just deal with pinning each section as I move through the quilt. Side note: because the background is champagne but my backing fabric is white, I'm using a very light tan thread on the front and white thread in the bobbin. I have had to be kind of neurotic about making sure that I use the right thread in both places! I'm almost done with the center nine blocks which means the hardest part of this process is nearly over! Even just moving from the center block to the inner ring was a huge improvement as far as bulk and quilt movement goes! Cheers to pushing things ever so slightly closer to the finish line! These blocks were very easy to sew together and align! I cut my orange fabric so that all of the stripes would go in the same direction for the flower. I added sashing strips between the flowers and on the sides so that the mini will end up about 22 inches square. I used a purple variegated thread from Superior Threads for the machine applique accents. Now this little cutie is ready to quilt! My plan is to quilt the orange section with peach thread, the green leaves with a green thread, and the background with cream. I am planning to use some additional fabric from the Bonsai line for the backing fabric! I am so excited to share that I have a quilt in the latest issue of Benartex's Modern By The Yard -- and it just happens to be the cover quilt for this issue! My inspiration for this quilt was to make a modern, pixelated rainbow made up of quilt blocks rather than simply squares. 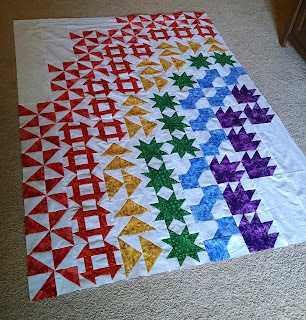 Each color of the rainbow uses a different block - red pinwheels, orange churn dashes, yellow flying geese, green sawtooth stars, blue bowties, and purple bear paws. Using the quilt blocks rather than colored squares gives it a slightly more abstract and modern feel. I picked out some of my favorite traditional quilt blocks to use for this quilt with the idea that a confident beginner could make this quilt. The quilt uses the Glass House Fabric line by Rose Ann Cook. This line is a fun grouping of tonal-type prints with somewhat unique patterns - including water droplets and cut glass. The very rich colors stand out from my white background! For the quilting, I used a motif of swirls and loops that mimic flowers without being overly feminine. The backing is a the grey facets print (third print in the third row above) and the binding is the sample purple fabric that I used for the purple bear paw blocks. It's a wonderful feeling to be able to finally share this quilt with all of you because I enjoyed designing it and working on it so much! Hop on over to see the full issue! Sharing at Let's Bee Social, TGIFF, and Finish it up Friday! Don't forget to enter my June Island Batik Giveaway!